This article explains how to interpret the Debugging Metrics statistics view, and how to use the data therein to troubleshoot and resolve common Wi-Fi issues. 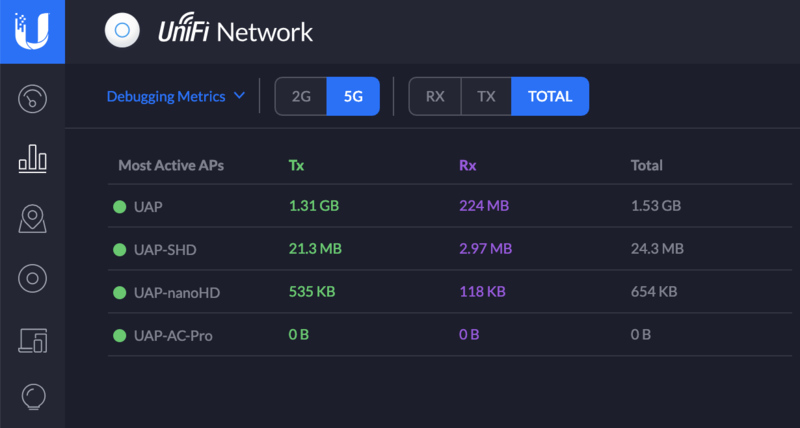 Each category contains a table that summarizes the data and can display information on the 2.4GHz band or the 5GHz one. In order for this feature to be available, users need to have at least one UniFi Access Point (UAP), although the data will be much improved with the use of a UniFi Security Gateway (USG) and UniFi Switch (USW). The following sections will explain the different fields of the Debugging Metrics view, giving network administrators the tools needed to resolve Wi-Fi issues they might encounter. This view lists the access points (APs) on the network that are sending/receiving the most traffic. Tx indicates packets transmitted, and Rx indicates packets received. At a glance, an administrator can identify if there are areas of higher demand that could benefit from having another AP available. Excessive use of an AP can lead to over-utilized memory/CPU, as well as poorer performance for over-active APs. Not enough APs to meet density demands: If traffic appears consistently too high on a given access point, add an additional AP to help handle the traffic. Alternatively, consider placing nearby APs closer to the over-utilized AP to help handle some of the client load. Poor Configuration on AP: If an AP has a Tx power that is set too high and nearby APs are set too low at lower levels, one AP can attract client devices with better signal strength but fail to deliver optimal Wi-Fi experience. To fix this, make sure all nearby devices are sharing the load with the over-active AP. Additionally, test lowering the Tx power on the active AP; and raise it on the nearby, less active APs. This can be accomplished through the device property panel under the Radio section. This view exposes the retry rate for both transmitting (packets that had to be resent to the client) and receiving (RX) packets (packets that had to be resent to the access point). The Retry rate indicates packets that had to be re-sent because they were corrupted upon arriving at the proper destination. Interference: This is the most common cause of packet loss/retransmissions. Identify whether the Retry rate is higher on one of the two bands: 2.4GHz or 5GHz, or if it is equally impacted on both. Then look for other nearby APs to see how local the interference is. This can point to a rogue access point, a very congested RF environment, a problematic client device near the AP, etc. To solve, perform an RF Scan, and place APs on less congested channels. Also, eliminate adjacent channel overlap on nearby UniFi APs. Another option would be to identify a problematic device causing the interference and re-configure/remove it. Client/AP Tx Power mismatch: Another common cause of packet retries is the mismatch of broadcast power levels (Tx Power). If an AP and client device are communicating at much different broadcast strengths, then this can cause packet retries. Look for packet retries on Rx specifically as this would indicate the more likely issue of the AP broadcasting too strongly for ideal behavior with the client. This view reveals which APs are utilizing the most of their assigned channel on 2G or 5G. This section also shows what portion of the utilization is due to the AP itself. Interference: If there is an access point with 59% Channel Utilization but only 15% combines Self Tx/Rx, this can indicate channel re-use/interference is the culprit. In a high-density environment, make sure you are minimizing the number of APs using each respective channel. Legacy Clients/Poor Data Rates: If high channel utilization is seen on an AP that largely comes from Self Tx/Rx, check the Most Active APs table to see if it is handling excessive traffic. If not, it is possible that poor data rates of older Wi-Fi clients are slowing down the AP and eating up a disproportionate amount of airtime. If this is causing adverse behavior you may opt to not provide connectivity to the lower data rates on this AP to prevent these older clients from causing issues. The Top Clients view shows what APs are handling the most client devices, and whether one band is more in use than the other. An over-utilized AP can limit network performance, and having too many devices on a particular band may also be undesirable. Tx Power Levels: In a higher density environment, if clients are connecting to an AP but should be connecting to another nearby one, this can indicate the access point in question is broadcasting at a higher strength than other nearby APs and may benefit from decreasing the Tx power on either band. This can be accomplished through the device property panel under the Radio section. It could also indicate that the other device(s) should have the Tx power increased. Typically this is more of an issue for 5G given the limited range. If devices are connecting to 2G heavily, this can indicate the need to lower 2G Tx levels on the over-utilized AP. 2.4GHz Band Over-utilized: In cases where an AP is seen to have too many clients on 2.4GHz, an administrator may opt to enable Band Steering on the AP. Band steering requires Advanced Settings to be enabled under Settings > Site. Once Advanced Settings are enabled in the UniFi Controller, band steering can be enabled by clicking on the AP with the high number of clients, opening the Properties Panel. Go to Config > Band Steering, and select "Prefer 5G". Save and apply changes and then monitor the AP to see whether performance improves. More clients should now be seen on 5G. AP Placement/Density: If one AP seems to have more clients connected to it than all the others, consider moving other APs closer, or adding another AP to ease the burden on the AP. This table shows the APs that have the most RF interference. RF interference results from other wireless communications disrupting the normal wireless communication to and from the APs. Excessive interference can cause a number of adverse effects on the wireless network. Look out for sustained interference levels of double-digits and higher. Poor Channel Assignment: Interference levels are specific to individual channels on each band, based on local RF environment. If you see high interference levels, do an RF Scan on the APs, then manually assign the AP to a channel on the 2.4G or 5G band that is less saturated with wireless signaling. If the network is dealing with severe interference, consider narrowing the channels (2.4GHz channels should in most cases stay at HT20 channel width, and 5GHz in noisy/high-density environments may warrant being narrowed to HT20 as well). Remember that channels must also be assigned correctly to avoid interference of other APs. Make sure to stagger channels and avoid using the same and adjacent channels on adjacent APs. Tx Levels: If interference is exceptionally high in a certain location, even with devices located local to the device and assigned to the optimal channel, this may indicate that the device is broadcasting too quietly. Try tweaking the Tx power up to medium/high, or use custom levels to see if interference levels are lower with a stronger Tx level. Sometimes excessively high Tx levels in certain environments can cause self-interference. If the AP is placed on a stone/brick/metal surface, self-interference can severely impact performance. In such cases, try lowering Tx power to see if the wireless connection will perform better. This table shows which clients are using the most bandwidth. Look out for highly utilized APs that are being over-used by a small number of clients. High Demand Clients: Sometimes the high bandwidth may be expected if a client device is a media server, camera or the likes. In such cases, if normal client-use is adversely affected, you may opt to confine high-demand clients to their own wireless network or dedicated access point. This can ensure that other clients have the optimal Wi-Fi experience, while still serving the most demanding clients. This view displays which clients on the network have been connected for the longest time. This is useful to identify widespread network issues, for example, if client uptime is low across the board. As well as identifying devices that should not be staying on the network for that long, for example in a coffee shop that offers complimentary Wi-Fi for current customers. Top Memory Usage indicates the percentage of AP hardware memory that is being used by its operations. Devices that may be dealing with abnormally high demand or may be encountering an error of some sort, may have the top memory usage. Typically high memory usage will accompany high utilization/demand; if you see abnormally high amounts of memory utilization i.e. >80%, clients may experience adverse performance. Top memory usage indicates the percentage of AP hardware processing resources in use by the AP at a given time. Similarly to memory usage, higher CPU usage will typically indicate the AP is more heavily in use. Abnormally high levels of CPU usage may point to a bug or an error on the AP.